there are on many of the Valley's boulevards. He told me that all workers call in by telephone early in the morning to get their name placed on a list. Contractors also call in with their request for workers. When the contractor arrives, the worker/s are waiting. The contractor pays an hourly rate to IFL. 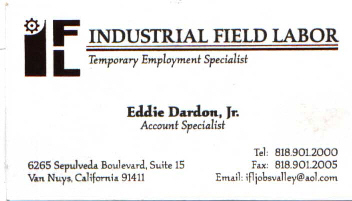 IFL in turn, pays the laborer. All laborers have social security numbers. Contractors are issued 1099s and laborers are issued W2s -- thus, unlike the illegal day labor centers which make it easy for contractors and laborers to cheat, IFL, the contractors, and the laborers must pay taxes. 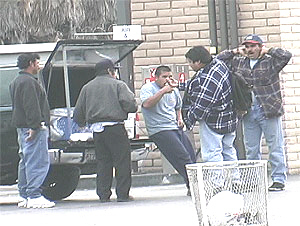 Laws that other cities have enacted to prevent day laborers from soliciting work from street sides have come under legal challenge from illegal immigration and open border advocates. These challenges have bogged any efforts to effectively limit solicitation by day laborers from street sides. Other cities have limited street side solicitation by Day Laborers by making it un-appealing to home owners to use contractors who use and exploit day laborers. Our leaders should call for the launching of a "disclosure" program. The program will consist of mass mailings and billboards advising home owners that most Contractors who use illegal day laborers are unlicensed and do not carry liability insurance -- and that they, as home owners could be sued if a day laborer is injured on their property. illegal day labor centers should be abolished. Instead the city leaders should call for outreach programs to contractors to use the services of legal day labor centers. 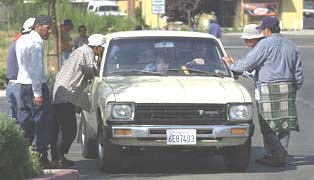 Day Laborers can be typically seen daily in the San Fernando Valley. 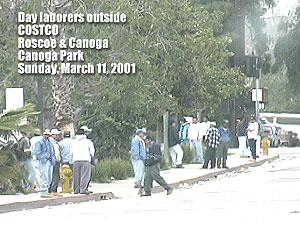 Typical San Fernando Valley scene of day laborers standing around on major streets. "Americans won't do the work that illegal alien workers will"
Home Depot Day Labor "Solution"